A new restaurant opening in the nearby area is always an exciting feeling for the people staying in the surrounding. 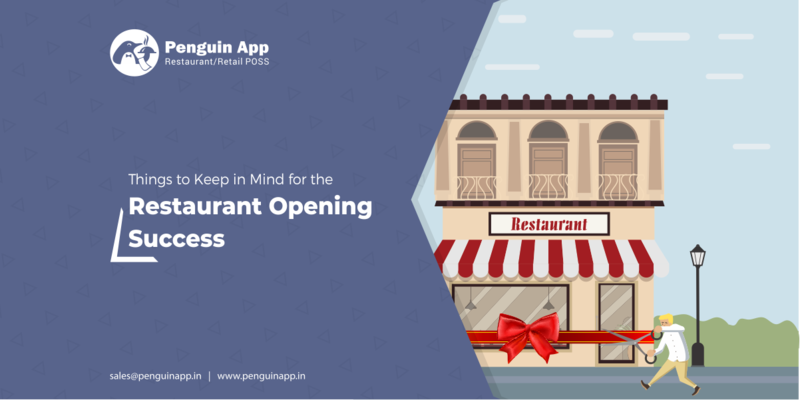 However, with new restaurants opening every other day, it becomes pretty challenging for restaurant owners to make a stunning opening that makes a mark in the surrounding and leads to success in no time. Right from hiring the staff to strategizing the marketing plan, to selecting the Restaurant Management Software or a Restaurant Inventory Software its needed to make sure that the guest data is collected systematically. There is much to bring in place before even attending to the first guest. These small-small things along with a proper business plan will not only ensure a smooth opening but will also keep your restaurant staff busy with guests and prior reservations. Even before opening the restaurant, it is always advisable to create a buzz in the market; this will build a base for you to connect with future guests. This can be done through various sources, i.e. social media, public relations, road shows, advertisements in events, etc. Doing this will help you in building restaurant fans even before the grand opening. Many restaurants drive the marketing show on own without any external assistance, and one of the easiest ways to execute the marketing strategy is through social media. The most effective platforms are Facebook and Instagram which possess millions of active users. These platforms can’t be ignored if you are looking for some serious acquisitions. These platforms enable users to interact with your brand and vice versa directly. If you have the most innovative dishes of sandwiches or pizza’s, share pictures on your Facebook and Instagram pages. If your restaurant offers a brunch or dinners with a view in the backdrop make sure to post those pictures on social media. Want to engage guests with your page? Roll out a contest and announce dinner for two at your restaurant as a reward to the winners. You can also implement Reserve or Book features to get reservations. In the digital world, customers have become smart, and they need instant replies to their concerns and inquiries. Hence, make sure your restaurant reservation system is integrated and addresses to all these areas at the same time your guest database will keep on a building when guests book online. Stay active on social media by responding to potential guests comments on your posts, stay active through regular posting, hashtags. Once the buzz is created, all you need is a young and dynamic workforce for every department of your restaurant. After all, you will have to keep up to all that you promised online while creating a buzz on the social media. Post multiple vacancies on job portals or tie up with a recruitment agency to address your staff requirement. Having a great staff and the right system in place to address various challenges faced in the hospitality industry is the precise way to move your business forward. All guests expect from a restaurant even before walking into the premises is world-class service, a great ambiance, and excellent food. The guest first encounter with your restaurant will be while making a reservation, so it is essential to pick a reservation system which is an accurate reflection of what you expect out of your guests and the one that justifies your brand identity. Do thorough research and choose the right solution for your restaurant business. Apart from processing the actual reservations, make sure to optimize the system which can collect guest data such as email id, contact number, meal preferences, and their favorite dish at your restaurant. These data will help you customize the service accordingly so that you can greet them by their name, recommend their favorite food, or would they want to try something new, and will help you build deeper guest relationship every time. Guests love it when they have been remembered from their previous visit and personalization in the services makes a huge difference. Along with this what matters is the ROI; hence it is vital to track the money spent to make sure the smooth functioning of the restaurant. This is possible with the help of the best software for restaurants which you should consider that takes care of your sales, cash flow, inventory and more. This will help you to run your business smoothly and empower your staff to focus on the guests. No restaurant will excel without a system that helps you track the cost of material in your kitchen. A system that manages invoicing and vendor payments empower the team to focus on specific essential tasks including spending time with guests and eliminates time invested in creating an invoice on a spreadsheet. When an online reservation management system is integrated with the POS, they become a powerful software solution to manage costs; share data across various locations instantly, and that will directly or indirectly help you achieve the business goals. Though opening a restaurant can be challenging in the initial stage. As long as proper planning, healthy workforce, a creative marketing plan and the right tools are available nothing can stop you make a grand opening that will make you stand out of the rest. Also involve your staff equally in all the decision-making process as they are the one who will be using the product and drive the show. Keep them motivated, create incentive plans, give them credit for the hard work and they will give their 100% to delight your guests every time they enter your restaurant.